Like many, Kasper Kotkansalo joined the USHL leaving him with the opportunity to attend (and play) at the collegiate level. 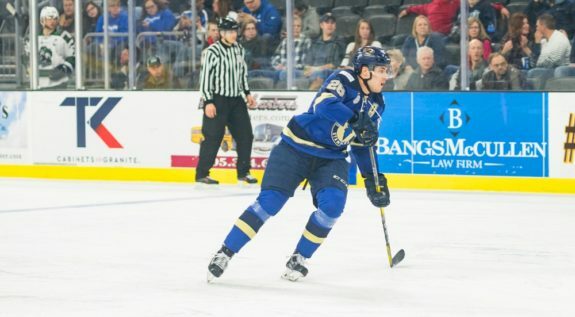 He is one of a handful of Finnish players to make the jump to the North American league last season, with two others playing for the Sioux City Musketeers. In a draft full of potential top-end defenders, Kotkansalo is often overlooked. However, he has the potential to play at both ends of the ice and made his presence felt both at the international level as well as with the Sioux Falls Stampede in 2016-17. In 47 games with the Stampede, he collected a goal and 12 points. While with Finland’s U20 team, he scored two goals and added four helpers in just 13 games. In both cases, he racked up a fair amount of penalty minutes, but that comes with a player who isn’t afraid to throw his body around and play a physical game. Kotkansalo will join Boston University next season as he’s committed to their collegiate program. With a draft where the depth of the talent is quite underrated, Kotkansalo slides in behind a handful of other defensive prospects. With that in mind, he likely won’t find a home until late in the third round or somewhere in the fourth round – but don’t let that determine how good this defenceman can be. His size and physicality can make him a second-pairing defenceman, but if he can master the art of the offensive game, he could play his way into a top-four blueliner. That being said, he will likely find himself on that second pairing when he establishes himself at the NHL level. While he hasn’t had a lot to write about in terms of awards and achievements yet, he could see some success at Boston University in the coming years. That being said, he was a part of the gold medal winning Finnish team at the U18 World Junior Championships in 2015-16.